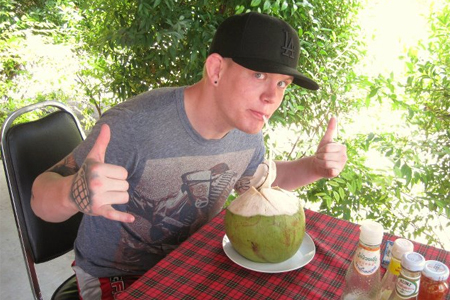 According to Phuketwan.com, Junie Browning (Pictured) is being hunted by Thailand police for allegedly inciting a brawl inside of a Phuket bar and continuing his assault in the emergency treatment ward at Patong Hospital. Authorities have been searching for the former UFC fighter since Sunday. The Phuket International Airport has also been alerted in case Browning attempts to flee the country. The police report states Browning was allegedly seen beating up on an expat woman in a local bar. He then lashed out at a female staff member when she tried to intervene. Four other tourists from Australia and the US also attempted to step in, but Browning subsequently went after them, as well. All of the participants were eventually taken for treatment at Patong Hospital. However, that’s when Browning decided it was time for the brawl to enter into round two. The troubled 26-year-old apparently fled the scene by the time Patong police arrived to the hospital. If this report holds true, it wouldn’t be the first time Browning has battled inside of a infirmary. In October of 2009, he assaulted three nurses in Henderson, Nevada who were trying to help him after a failed suicide attempt. Browning was immediately released from the UFC after charges were filed.